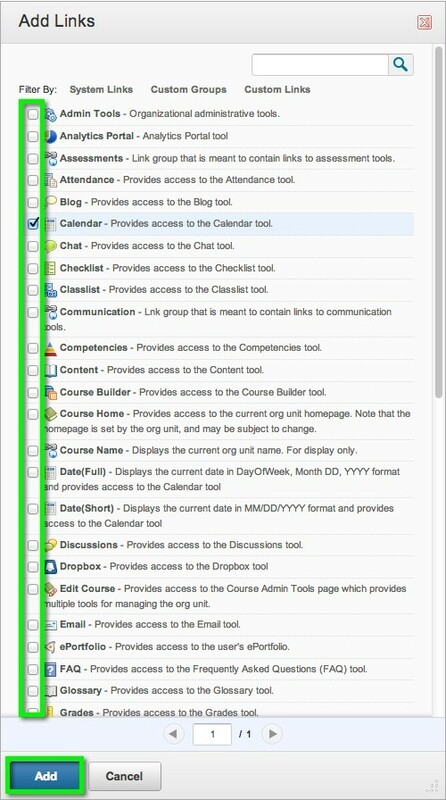 The following documentation will demonstrate how to add a tool to the course navigation menu. *Note: The default course Navbar does not have the ability to be editted. A new Navbar will need to be created in order to add links/tools. 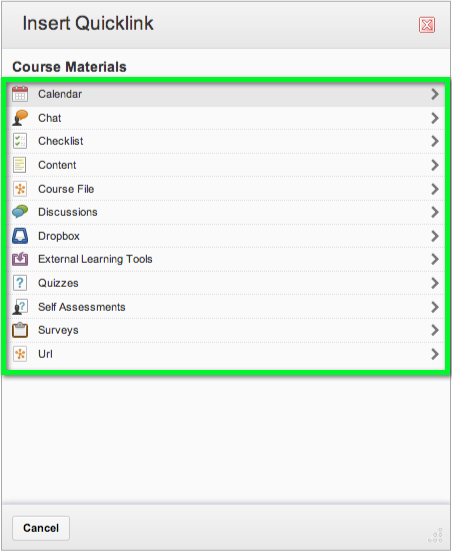 Log into your course and click on Edit Course. Click on the title of the active navigation bar, denoted by (Active) next to the title. Click the Create Navbar button. Enter a title in the Name: text field. Move to step 4 below. Click the Copy icon in the drop-down menu to the right of the Navbar you wish to copy. Click the newly created Navbar link (named Copied Navbar Name Copy). Rename your Navbar if you wish, then move to step 4 below. 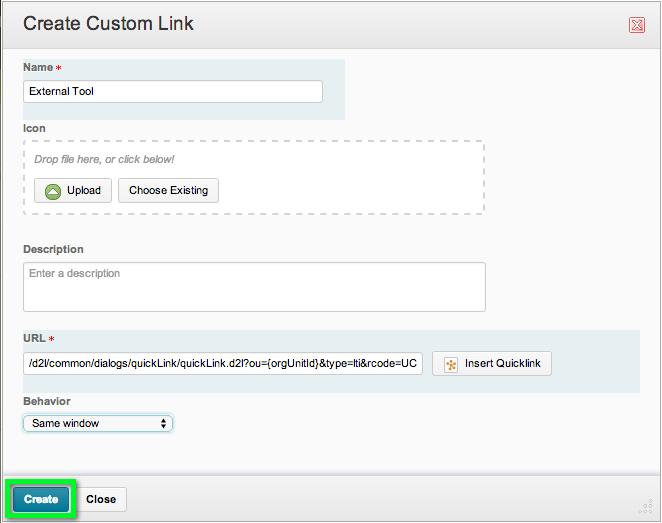 In the location that you would like to add a tool click either Create Custom Link or Add Links. 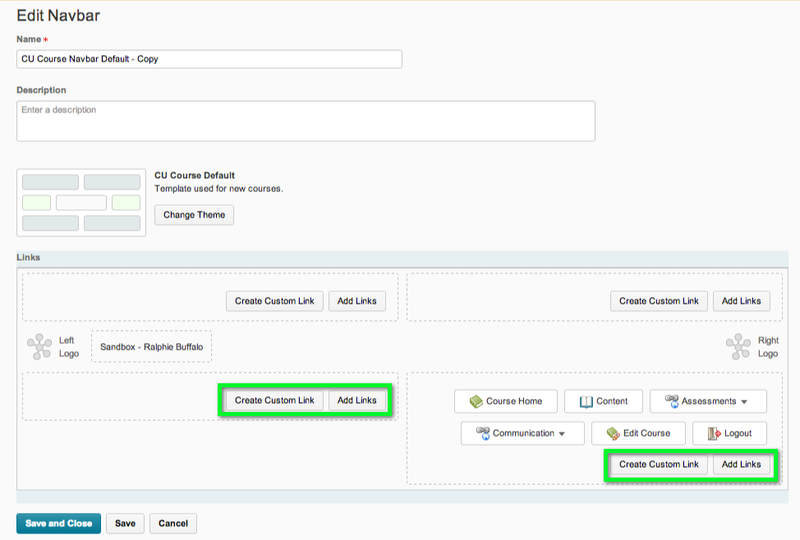 Add Links: If you chose Add Links, for links existing tools within D2L, continue to step 5. 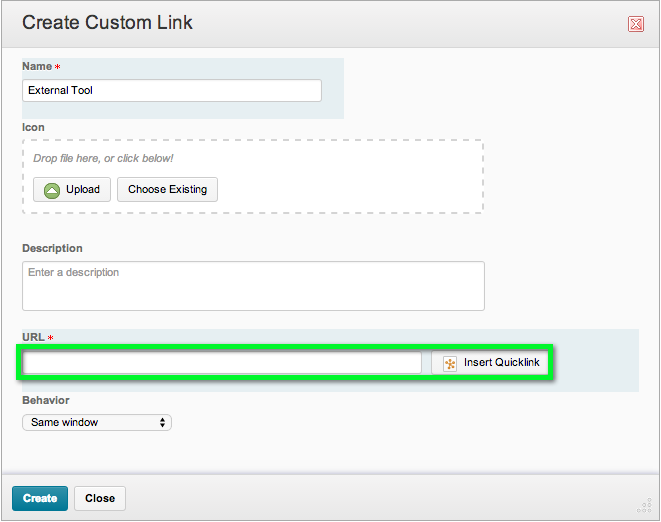 Create Custom Link: If you chose Create Custom Link, for external learning tools or custom urls, continue to step 6. *Note: The links that appear on the main course navigation bar are located in the the Bottom Left Link Area and Bottom Right Link Area. Find the tool you would like to add to the bar, and check the box next to the tool. Click Add. Proceed to step 11, after clicking Add. Type a name for your custom link in the Name field. 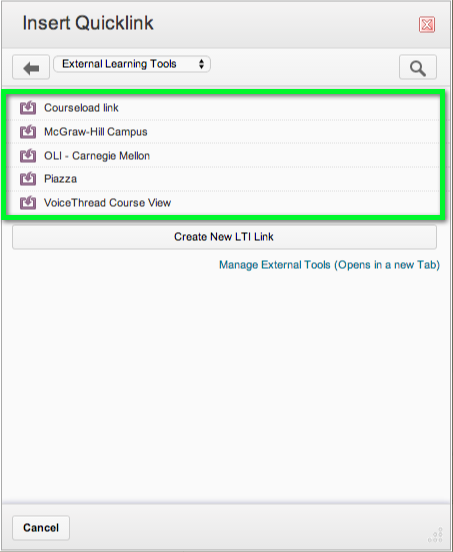 If you are linking to an External Learning tool (i.e. 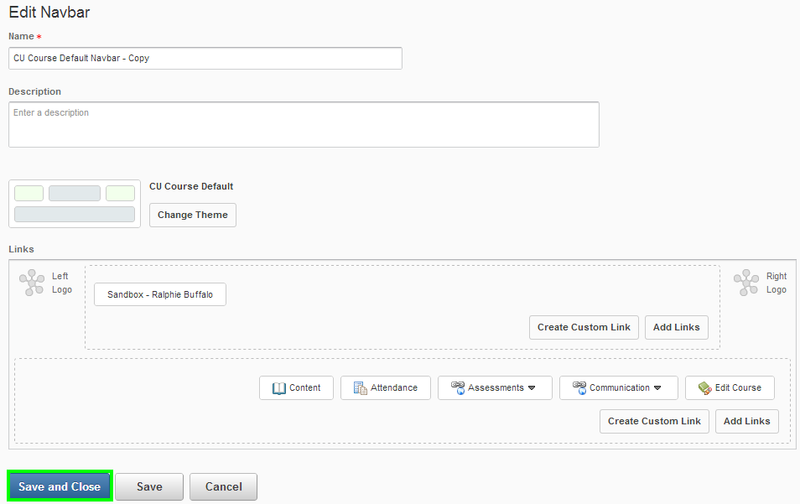 McGraw Hill) or a specific course item, click the Insert Quicklink button, then proceed to the next step. 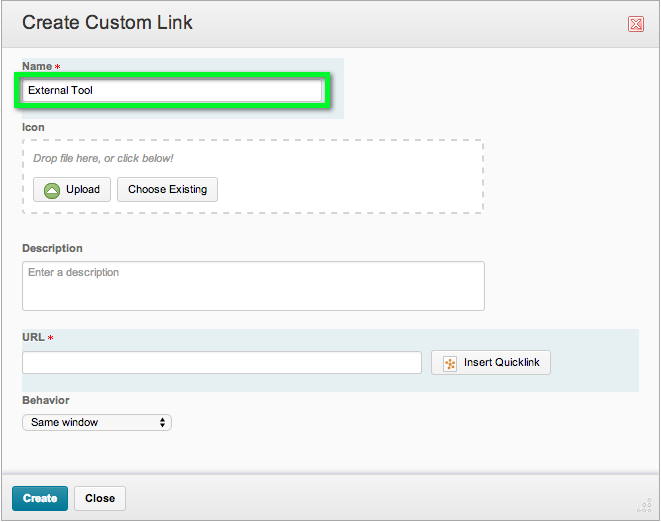 If you are entering a custom link, type it into the URL field, then proceed to step 10. Click on your desired area, most commonly External Learning Tools. The following step reflects inserting an External Learning Tool link, but other processes are identical. Click on your desired link. When done adding links, click Save and Close. Make sure that your Navbar is set to active. If not select your Navbar from the drop-down menu. Click Apply. Your tool will be displayed on the navigation bar once you leave the Edit Navbar screen.